Dangerous assumptions lurk below the surface of our preaching preparation, always ready to undermine our most diligent exegesis and expositional planning. We can diligently do everything well in our study and message preparation, but the tinted glasses of our own dangerous assumption will colour the end result and undermine the preaching process. Our goal in pondering these assumptions is not to throw stones at others, but to prompt us to pray and ask God to help us see where we aren’t seeing clearly. It can be painful to discover an errant agenda in our preaching, but if our goal is to please Him, then surely we must ask Him to show us if there be any dangerous assumption in us. 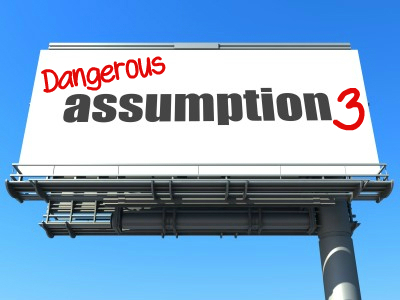 Dangerous Assumption B: It is all about God. 5. The glory filter. There is no question that everything should be done for the glory of God. But some have morphed this doctrine into a form that seems to have lost the relational and motivational moorings of Scripture. Rather than seeing the delightful glory-giving nature of the Triune God who is revealed by Scripture, glory becomes this dutiful commodity that a self-absorbed God demands from us constantly. There is a real danger that glory can become the measure of behaviour demanded of listeners, without their hearts being stirred by the glory of God’s glory. Haman glorified a man he despised from the heart. But God the Father has always glorified the Son because he loves him (John 17:24). Should we be stirred to glorify God by the preaching of His Word? Absolutely. Who would ever come up with a God who is all-glorious, yet also lovingly gives glory to the undeserving? The danger is when we twist the God behind the text into a glory-grabbing tyrant and preach every passage accordingly. It will sound very biblical, but it may end up being a slightly sanctified variation on the duty filter that turns everything into a human-centred preaching model. Tomorrow we’ll think on another variation of an “all about God” filter that may not be consistent with the Scriptures.